Admittedly, I don't buy a ton of hip hop records anymore. I listened to a lot of rap from about 1988 to 1993 or 4, but after that I just lost interest. As the genre became more popular, I feel like the options became less diverse. I know a lot of the really innovative stuff got pushed underground and I have stuck my toe in from time to time, but to me, that late 80's early 90's era was the golden age of rap. Released in 1991, this could be considered one of the most important hip hop records I ever bought. Not necessarily because of its direct influence, but because I liked it enough to purchase Del's follow up No Need For Alarm, in 1993. No Need For Alarm became my all time favorite hip hop record ever and led me to go crazy buying everything in that was released by Del's Hieroglyphics crew. Souls Of Michief, Casual, Extra Prolific; they all ended up being some of the greatest records I ever heard, but it all started here. I Wish My Brother George Was Here is primarily built off of Parliament Funkadelic samples. Though, when this record came out, sampling P-funk wasn't quite as common as it later became. Most people know the hit single off this record "Mistadobalina," and it's a hit in every sense of the word. Seeing the video on Yo! MTV Raps made me immediately rush out and buy this album. But's in not a one song record. "Hoodz Come In Dozens," "Pissin' On Your Steps" and The Wacky World Of Rapid Transit" all should have been big hits. The entire album is remarkably strong and it's downright eerie to think that this record came out 24 years ago. While Del would absolutely surpass his debut with No Need For Alarm, I Wish My Brother George Was Here is no slouch of a record. 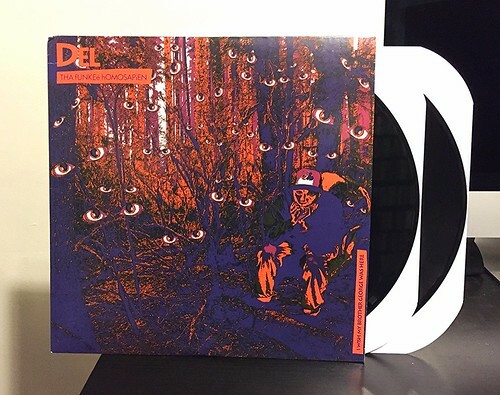 Del's dynamic lyrics and slightly off kilter flow are still on display and while it doesn't hold up quite as well as No Need For Alarm, it's still a pretty important record to have in the collection. I couldn't tell you why it took quite so long to add the vinyl version to mine.